On daily plotting, GBPCHF has formed double top pattern with top 1 at 1.3115, top 2 at 1.3172 and neckline at 1.2758 levels. The pair formed shooting star pattern at 1.2785 and 1.3040 levels (on daily and monthly respectively), the bears have managed to drag the downswings ever since then. It has now breached below neckline with intensified selling momentum. On the broader perspective, downswings are most likely to extend further after sliding below 21EMA on the occurrence of shooting star, both trend & momentum oscillators on bearish bias. Momentum study: Both leading oscillators (RSI and stochastic curves) show downward convergence to the ongoing price slumps that indicate the bearish strength. 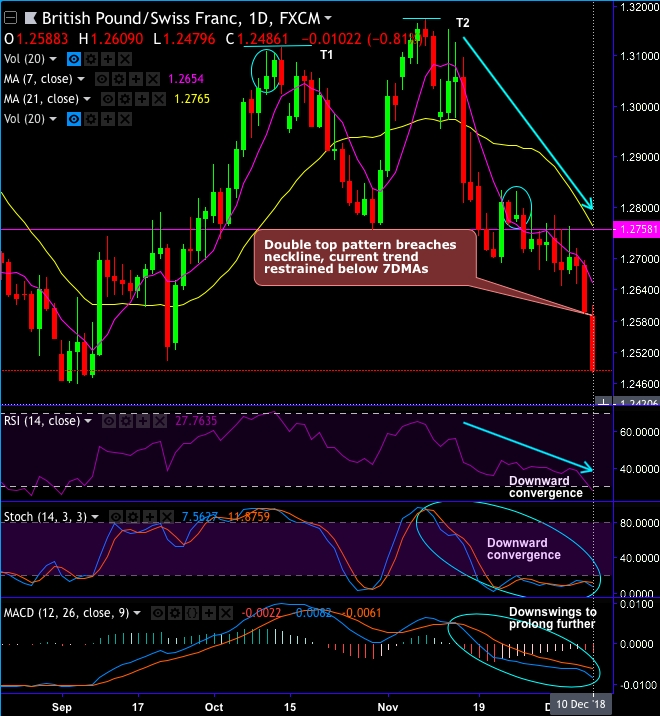 Trend analysis: MACD shows bearish crossover that indicates downtrend to prolong further. Trade tips: One can now uphold shorts in futures contracts of mid-month tenors with a view to arresting further potential downside risks. Writers in a futures contract are expected to maintain margins in order to open and maintain a short futures position. Alternatively, on daily trading grounds, at spot reference: 143.360 levels, we advocate constructing tunnel spread, using upper strikes at 143.9360 and lower strikes at 142.815 levels. The strategy is likely to fetch leveraged yields as long as the underlying price keeps dipping but remains above lower strikes on the expiration. Currency Strength Index: FxWirePro's hourly GBP spot index is flashing -95 (which is bearish), while hourly CHF spot index was at 117 (bullish) while articulating (at 13:39 GMT).